Daily intake of almonds, sprouted fenugreeks, sprouted green grams have immense health benefits. 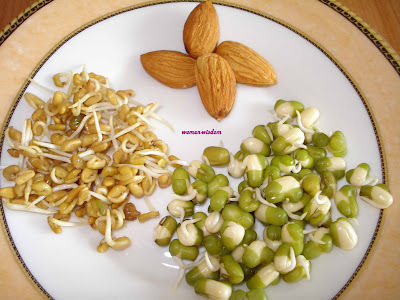 I recommend a plate of these sprouts and almonds daily as the first intake will aid women for a healthy life enough to take care of her family without fatigue Hey, go through the repayment of these stuff to our health and enhance your natural beauty. Diabetes: Sprouted Fenugreek help lower blood glucose levels. Cholesterol control: Fenugreek is rich in steroidal saponins. This may help reduce total blood serum cholesterol and LDL, without effecting HDL. Menopause: Fenugreek seeds contain diosgenin (used to make semi-synthetic form of estrogen). This may aid as an aphrodisiac for women, used as Hormone Replacement therapy during Menopause. 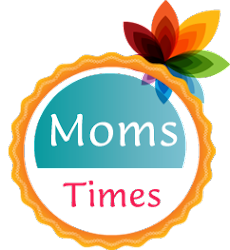 Lactation: Mammary glands are modified sweat glands. Fenugreek stimulates sweat production, ergo lactation. Fenugreek seeds may stimulate uterine contractions and must be avoided in medicine form by pregnant women and good for a lactating mum. Documented studies show an increase of up to 150% in the milk production of nursing mothers. Hair Growth: It is believed that Fenugreek stimulates blood circulation to hair follicles to promote hair growth . For hair loss, Fenugreek should be taken as a dietary supplement as well as applied topically. It overcomes the problem of dandruff extensively. Hair Conditioner: Grind pre-soaked Fenugreek seeds with curd. Apply the mixture to scalp , scrub, and cover the hair with the mixture. Leave it on for 20 minutes. Wash and rinse to see silky shining hair. Cools the body and good for summer. Fevers: It is an excellent medicine during cholera, measles, chicken-pox, small-pox, typhoid and all types of fevers. It can be given in a small quantity even during acute phase of appendicitis. Gives a enhances complexion of skin when taken in. Also the flour of the green gram is an excellent detergent and can be used as a substitute for soap to get soft skin. When applied over the face bleaches the color and gives good complexion without any irritation. Aids hair growth. Also its flour can be used for washing the hair to prevent dandruff and get a long hair. 90% of the fat in almonds is unsaturated fat, and frequent consumption, as a result, could help lower blood cholesterol levels. Almonds are a plant based food, so they contain no cholesterol. Almonds are loaded with protein, fiber, calcium, magnesium, potassium, vitamin E and other antioxidants and phytochemicals, contain the right kind of fats-monounsaturated and some polyunsaturated, so they help lower low-density lipoprotein (LDL), the bad cholesterol, while not touching the high-density, or good cholesterol levels. Rich in folic acid and lower risk of cancer, diabetes, Alzheimer's disease, and other chronic illnesses. Very good for hair growth as it strengthens the roots of hair avoiding hair fall. Very good article, thanks ! !